I was going through some of my books and manuals this morning and stumbled across this old favorite. I spent a few minutes flipping through the pages and was reminded just what an absolute gem of a book it is. I consider it a minor classic. And so it should. This is not a textbook or a reference, it is an educated man’s introduction to the concepts of topographic mapping. Authored by somebody who had a deep understanding of the subject and knew how to write for general audiences, it is readable, enjoyable and instructive. Although this book was first published in 1944 and incrementally updated through 1964 it gives up little to the back half of the 20th century because it focuses on concepts rather than gizmos. There’s not a word or hint of satellite navigation, space-based imagery platforms, world-wide datums and coordinate systems or computer-based mapping. Greenhood’s discussions on things like scale, perspective, contouring, projections and map compilation are some of the best and easiest to grasp that I’ve ever encountered. Greenhood’s coverage of these concepts stand the test of time because they don’t change over time. Scale is scale, perspective is perspective, whether you are looking at a paper map or a computer screen. Some of the topics seem quaint, like how to properly sharpen a pencil or how to select the correct paper for drawing a map, but the discussions are charming and still somewhat useful in today’s world. Most of the referenced publications are out of date and long out of print, but it’s important to note that many of Greenhood’s references were classics in their own right and are themselves worth hunting down and reading. One of the real strengths of this book are the illustrations. Most of the illustrations are hand drawn and they remind us that a talented illustrator can easily convey complex information in ways photographs can’t. The illustrations are expertly integrated with the text and provide support and reinforcement to the topics under discussion precisely when and where needed. I bought my copy of Mapping in 1982 at the bookstore in the Smithsonian Museum of American History in Washington, DC. It has been paged through and referenced so many times the binding is starting to come loose. This morning I jumped out to Amazon to see if the book was still available. I’m pleased to see it is still published by the University of Chicago Press, but the price is an eye-bleeding $32.50 – quite a lot for a trade paperback. However, copies are available from used booksellers for very reasonable prices. I grabbed a new-condition copy from an Amazon partner bookseller for $6.95, not much more than the $5.50 I paid for my current copy back in 1982. 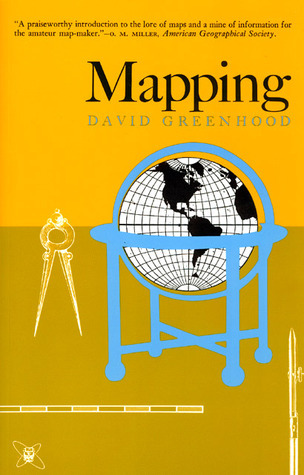 If you are at all interested in mapping, or want to introduce the concepts of mapping to a young audience this book is an excellent start. I’ve read a lot of books on mapping down through the decades and this is the best single volume introduction to the field I’ve ever read. This entry was posted in General, mapping and tagged david greenhood by Brian Haren. Bookmark the permalink.